백자 청화운룡문 병(白磁 靑畵雲龍文 甁)은 조선시대 만들어진 높이 21.5㎝, 아가리 지름 4.6㎝, 밑지름 6.6㎝의 병으로 청화백자운룡문병(보물 제785호)과 같이 출토되었다. 아가리는 밖으로 벌어지고, 목은 좁으나 아래로 내려가면서 차츰 팽창하여, 전체적으로 풍만한 느낌을 준다. 담청색을 띤 백자 유약이 전면에 두텁게 칠해져 견고하며 치밀하다. 코발트색을 사용하는 청화안료로 그린 그림은 전체적으로 어두운 편이나, 구름과 용의 얼굴에 부분적으로 농담의 차이를 두어 변화를 주고 있다. 구름 속에서 여의주를 잡으려는 용은 살아서 움직이는 듯한 꿈틀거림과 용의 눈에서 보이는 기운이 돋보여 매우 뛰어난 솜씨를 보인다. 용무늬는 왕이 사용하는 그릇에만 사용할 수 있었던 것으로서, 왕실의 연례용으로 사용되었을 것으로 보인다. 조선 초기에 경기도 광주 일대의 국가가 관리하는 가마에서 만들어졌다. 청화백자 중 용무늬가 새겨진 중요한 자료이다. This jar is 21.5 cm tall, while the diameter of the mouth is 4.6 cm and that of its base is 6.6 cm. The mouth broadens outward. Although it has a narrow neck, the jar gradually gets wider as it goes down. The white porcelain looks firm and delicate because its entire surface is heavily coated with light blue enamel. 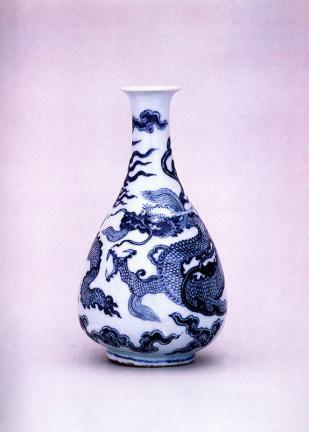 Although the overall tone of the images painted in cobalt pigment is dark, different shading applied to the clouds and the face of a dragon creates some variation. The dynamic wiggling of the dragon trying to catch a cintamani in the midst of clouds, and the power generated from its eyes display the excellent artistry of the craftsman. Since the dragon design was used only for vessels used by kings, this one must have been used at annual events held in the royal palace. This excellent piece makes a good pair with the National Treasure No. 785, which was made at a kiln near Gwangju in the early part of the Joseon Dynasty. Among many pieces of white celadon porcelain, this pair with a dragon design has an important historical value.